The article must always have an introduction, and it has to be fresh: the essence of column writing. The short version is you have to draw in the reader’s attention with something new, but that’s a big ask. You have this article series which has a repeating topic area but each article’s content never repeats and has vastly different conclusions. That’s a new column. See, no one could have predicted that I would do this entire intro as a Jurassic Park reference. And now Jordan is, ah, giving me side eye for the unorthodox and irreverent intro. So here I am again, introducing my article again. That’s column writing. In other news, spoilers have begun for Guilds of Ravnica. While we haven’t seen much yet, my hackles are up. Based on the revealed mechanics and themes, this is going to be another graveyard-centric set. Wizards did create dredge, and considering that Amonket gave us Hollow One, I’m betting there are plenty of Modern plants in the set. I’m hoping there’s no new monster as well, but we shall see. Following my Top 8 performance last week, I stuck with the same deck. That said, there were cracks showing. I was having to Ghost Quarter my own lands a lot; far more than I’ve ever needed with other decks. It wasn’t even a case of needing colored mana for non-creatures. I’ve constantly been stuck with one colored source and two or more actual colorless lands for creature spells. It’s statistically rather anomalous and incredibly frustrating. Additionally, my anti-creature sideboard is incredibly mana-hungry. Worship and Settle are hugely impactful and frequently win games, but actually casting them has proven difficult. The upside was sufficient that I thought the risk worthwhile, and during testing and weekly tournaments it was never a problem, but the mana cost issue was something I decided to keep an eye on during this PTTQ. This week’s store was the same one from my States report last year. I haven’t gone back since then because it’s quite far away and tough to make their PPTQs due to scheduling, but it was pretty different from what I remembered in terms of size and layout. I’ve never actually seem them with the same layout twice. The current configuration was on the smaller scale for them, and yet still comfortably accommodated all 42 players for six rounds of Swiss and some Sealed side events. My scouting revealed lots of Humans and Burn, with Mardu Pyromancer and Eldrazi Tron on the periphery. Fortunately, my sideboard was built with these decks in mind. As the day went on, I found out that the field was actually full of Living End, Hardened Scales Affinity, and brews, the most notable of which being RW Legends. Modern’s diversity never ceases to amaze. What ended up being the most frustrating tournament I’ve played in years starts off on the draw against Burn. Fortunately, he’s on a slower start without creatures, and I have Wanderer to protect myself from Searing Blaze. Eidolon of the Great Revel hurts him more than me, and I win at a comfortable 11 life. For game 2, I have a great hand against a creature draw, but he never plays creatures. I’m always behind and get finished off by Ensnaring Bridge. My only hope is to hexproof all my creatures and Worship lock him to win by decking, but he had Destructive Revelry before I had Spell Queller. In game 3, he has a very awkward draw and is leaning on his Eidolon. I play into Eidolon to build a board that he can’t challenge and win at 1 life. Round 2 is against Humans. The player in question and I have actually played at three of the previous PPTQs this season. As a result, the matches are getting closer. In game 1, I just get swamped when I have only one Path and can’t outgrow his Mantis Rider in time. For game 2, my hand is Vial, Wanderer, Rattlechains, and Sword. He has a fairly slow start too, and I use Rattlechains to save Wanderer from Izzet Staticaster so I can equip and start swinging. He can’t answer the equipped Wanderer or race the lifegain, which is fortunate as I’m flooding hard. In game 3, his start is slow, but builds like a landslide. Fortunately, my hand was just fast, and I can race him. Staticaster is getting a lot more play and in greater numbers which is a problem for Spirits. I’m feeling very confidant going into round Round 3, but that’s when the wheels come off. I’m against Jeskai Tempo, which is normally a great matchup, but I have very awkward draws game 1 and only win because I Quarter him off red mana. In game 2 I keep a sketchy hand on the draw and his hand lines up perfectly to wreck me. If I had played game 3 better, I may have won easily. Instead, I threw it away with misplay after misplay. In an early exchange, I Image his Geist of Saint Traft instead of going for the Drogskol lock, which I could have done thanks to Vial, then lose most of my board in trades that I could have played around even without the lock if I’d sequenced or planned better. Over the course of the game, I continue throwing away cards for no material gain or even actively losing value for no real reason. Despite all that, still I just barely lose with him at 4 life. Round 4 is against Humans again, and that deck does its thing in game 1. By turn three, my opponent has played three Thalia’s Lieutenants, and even if I had all my Path’s I wouldn’t beat that explosion. In game 2, my single mulligan easily crushes his double mulligan. Game 3 is mostly a stand-off until he is finally able to play out his hand and overwhelm me. I’m stuck on two lands the whole game with all my four drops in hand. Were those playable spells I could have won easily, but instead I had to impotently sit there until things come together for my opponent. Prizes are only for Top 8, which I am now eliminated from, so I drop, angry at myself. I don’t remember playing a worse game of Magic at any competitive event. I punted more in Round 3 than the Cleveland Browns, and deserved to lose. The fact that I almost didn’t is a testament to how good the matchup really is for Spirits. If I take any line except the one I do, I don’t lose that early exchange and probably win the game handily. I even considered those better lines, but forged ahead anyway. It was like I was just sleepwalking through the game. Ultimately, my problem this tournament was overfamiliarity with my deck and with Modern in general. As it is possible to blunt a knife by sharpening it too much, I have overpracticed, and am playing worse as a result. Every player hits a wall eventually where they think they’ve seen it all and can just play on muscle memory and experience rather than analyzing the game state and thinking. No bones about it: I need to disengage autopilot and get my head into the game again. That probably means shelving Spirits for the week just so I’m fresh for the next PPTQ. Even then, I’ll need to take extra care to think before making plays and really plan my lines and turns. On a more general level, I’ve almost certainly gotten overconfident in my abilities to the point of arrogance. I’ve convinced myself that things will work out the way I want them to, and have forgotten the old saw that the opposition gets a vote too. It’s time to eat humble pie and take my lumps. I’ve had enough with the frustrating aspects. I’m losing to drawing too many four-drops and awkward mana because of all the colorless lands. I don’t know if this is an actual problem that other players have, or if I’m too hot under the collar from the tournament, but I’m not sitting on this anymore. I intend to make a number of decklist changes, starting with adding another colored source. Moorland Haunt has been pretty poor in general, but seeing how many Izzet Staticasters are running around means I don’t feel bad about just cutting it for a colored source. As for the sideboard, I’m cutting the four-drops. Settle is powerful, but I’ve lost games because I never hit four lands and both were in hand. Worship was a game-winner, but after all the success Spirits has had recently, Burn and Humans are always bringing in Destructive Revelry and Reclamation Sage, so it isn’t anymore. What I really wish is that Celestial Kirin was good, because it would close a lot of holes, but it’s far too clunky to actually play. Most of the aforementioned problems could be solved by going Bant. Most Bant lists run 22 lands. Coupled with Noble Hierarch (and sometimes Birds of Paradise) mana or color screw are rarely a problem for Bant Spirits. Ergo, all of my problems with UW are solved. Unfortunately, going Bant creates just as many problems. For starters, the mana base is far more painful and less flexible. 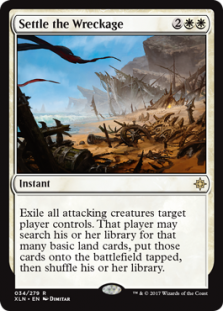 Every list I’ve seen relies on 9-12 fetchlands and 4-8 shocks, and that’s a lot of extra damage. Burn is a close matchup for UW already, it’s much harder for Bant. Hitting too many colorless lands isn’t a problem because Bant can’t run many in the first place. This added stability is balanced by losing the value of Mutavault and Ghost Quarter. Another big issue with the switch is deck flexibility. UW is far trickier, though not as powerful, as Bant. Collected Company is a brute-force tool meant to smash through opponents with mana and card advantage. This is balanced by the cost, and by it being very hard not to telegraph an intention to slam it at earliest opportunity. 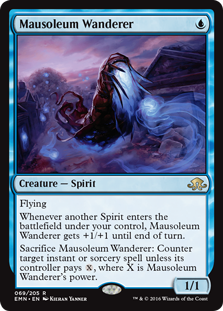 By contrast, UW uses Vial to constantly keep opponents guessing and interact more favorably. Company doesn’t represent anything specific, making it often better to just play into it. Meanwhile, playing into Vial representing Spell Queller or Drogskol Captain is far riskier, especially with open mana representing something else. Having to consider two spells rather than one generates far more uncertainty for opponents. This uncertainty in turn translates into virtual card advantage. There’s also the flexibility of having the option to play anything on end step without Rattlechains. As a result, UW is far better against the control and Burn decks that I frequently encounter. However, should I fail to solve my problems with UW, I may have to switch to Bant for my own peace of mind. While this week was humiliating, I’m still going to keep forging ahead in my quest to requalify for the Pro Tour. If nothing else, I hope that everyone is learning from my mistakes and avoiding my fate. Best of luck to everyone else on the grinder’s path. Many of the most succesful lists on MTGO are bant and plays both vials and CoCo (9-0 and 8-1 at PPTQ are huge results! Another 5-0 happened just after). Surely the deck plays differently, but I think it’s worth. Hierarch is a monster. 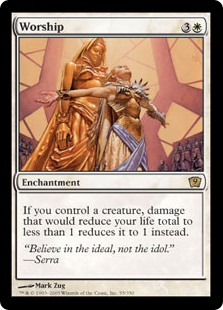 Not only for fixing mana, but exalted is relevant most of the time too. I’ve seen that, and despite what Ondrej Strasky says I’m unconvinced. When I’ve tried the lists they feel oddly disjointed, a hybrid that doesn’t really work. There’s a lot of very powerful things they can do when it all goes right but in my testing things had to go exactly right for it to be measurably better than Bant or UW. Because it (normally) cuts on Rattlechains and utility cards it lacks the flexibility of UW, and because it cuts creatures the Company’s are less impressive than just Bant. My opinion is that it’s a run-well deck. When does its thing it’s far better than the alternatives. When it’s off or something goes wrong, the seams burst.